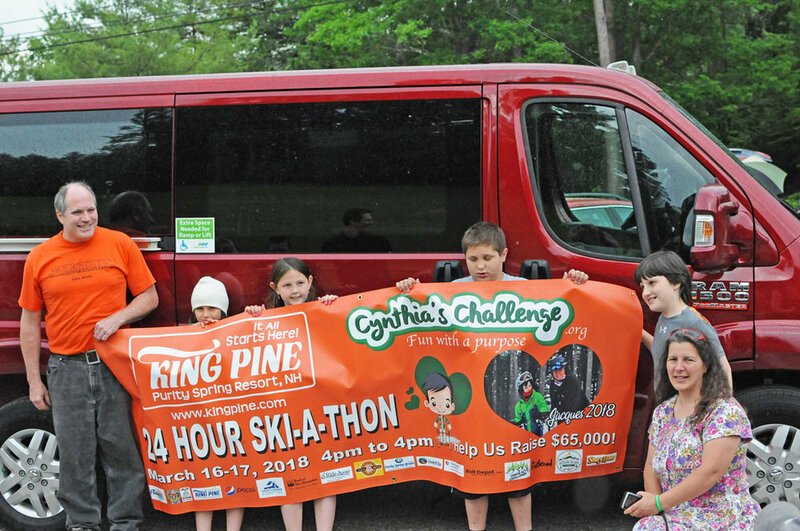 East Madison, NH (June 14, 2018): Cynthia's Challenge, a 24-hour Ski-A-Thon held this past March 2018 at King Pine Ski Area delivered on the promise to purchase a $65,000 handicap van for a local family in need. On Wednesday afternoon, June 13, the handicap van was presented to the Villeneuve family at King Pine Ski Area. The $65,000 raised at the ski-a-thon covered the cost of a handicap van for 9-year old, Jacques Villeneuve of Freedom, NH. Jacques was diagnosed at a young age with Agenesis of the Corpus Callosum as well as Diplegic Spastic Cerebral Palsy. Jacques' parents have to physically lift him into their vehicle every time they plan on going anywhere and then have enough room for storage for his walking assistance devices. In its fifth year, Cynthia's Challenge has now raised over $246,000 to fulfill the needs of children including a service dog for Cynthia Verrill and handicap accessible vans for Sammy Gillard, Kevin Dall, Faith Holt, and now one purchased for Jacques Villeneuve’s family. Tax deductible donations are still being accepted to help Cynthia’s Challenge continue to operate and support local families. Online donations are welcome at cynthiaschallenge.org and checks made out to Cynthia’s Challenge are also being accepted. For more information, please call King Pine or Purity Spring Resort at (603) 367-8896 or email info@purityspring.com.